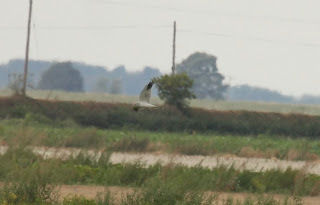 Pallid Harrier - Haddenham, Cambs. 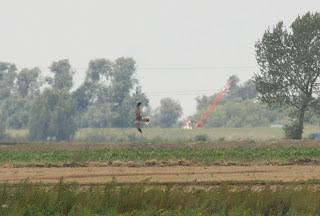 I'd seen Pallid Harrier before, in Kent and a roosting bird near Stiffkey, Norfolk. The Kent bird was distant but tickable but if theres a chance to get better views of a bird I like to go for it. A bird in Cambridgeshire was an opportunity too good to miss. Again my Sat nav went against all my own instincts and refused to recognise the existence of the A14, but I knew best. We had a slight disagreement around Huntington but it was quickly resolved. I think were both learning to understand each other a little better now and I can see a more mature relationship developing. I pulled up next to a few birders cars and started to scan the surrounding landscape. the main body of birders was further along the track but we had a good field of view or view of field so I plumped for staying put.WRONG! After over an hour there was a message on the pager saying the Harrier was showing again. We dashed to where the rest of the birders were watching only to be told by Lee Evans that the bird had landed on the ground about 1/2 mile ahead of us but not before giving 'crippling views'- cheers Lee. At least now we knew exactly where the bird was. It was just a question of waiting,and waiting. I decided to use my initiative and move to another track alot closer to where the harrier had gone down. There were only a couple of 'locals' there. After another hour or so a further pager message informed us that the Harrier was sitting in a ploughed field. We located it straight away as it was relatively close to our position. We moved to the end of the track to get closer views and were rewarded with excellent flight views culminating in the Harrier taking a Meadow pipit using its telescopic legs and amazing agility to great effect. I was able to obtain some stunning photographs using SAS like field skills and my extensive knowledge and experience of photography. There were also 4 Marsh Harriers and 2 Hobby seen in the area.